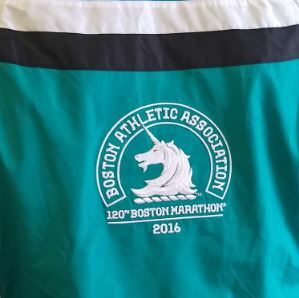 Christopher Kuntz, wearing his 2016 Boston Marathon jacket. For distance runners, there is no race more important than the Boston Marathon. Known simply as “Boston,” the race is the oldest annual marathon in the world. The event is always held the third Monday of April. For many non-elite runners, qualifying for Boston is a life-changing, bucket list item. Many train for years before they qualify and most never make the rigorous cut. 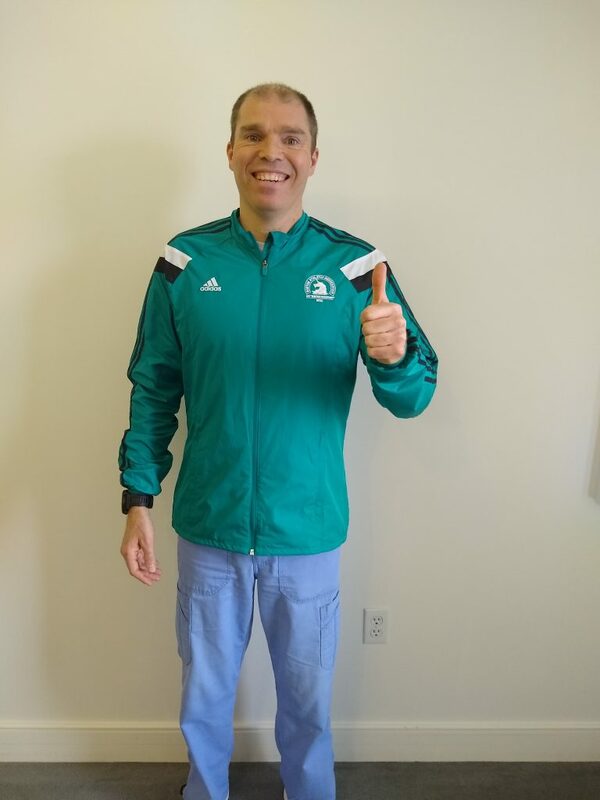 For 37 year-old Bethany Village RCT (resident care technician) Christopher Kuntz, the 2019 Boston Marathon is another chance to improve. He ran the race previously in 2016. Kuntz is a two-year employee of Bethany and a lifelong runner. His passion for foot racing began in high school where he ran track and cross-country. Originally from San Francisco, Calif., life changes found Kuntz in southern Ohio and employed by Graceworks Lutheran Services. Before his move to Dayton, Ohio, he was an RCT in Minnesota. During his 25 years in the Bay Area, Chris clocked many miles throughout high school and junior college. Once during a high school cross-country meet, Kuntz found himself running against would-be Olympian Ryan Hall. “He smoked me!” laughs Kuntz. Ryan Hall is from Big Bear, a runner’s paradise known for being at altitude, which helps training and recovery. Kuntz was racing division III and Hall was in division IV. Do not let Kuntz’s modesty fool you. While Ryan Hall is the fastest marathoner in American history (2:04:58 at the Boston Marathon in 2011), Kuntz is no slouch. To run Boston as a non-elite athlete means earning an aggressive qualifying time. Kuntz’s qualifying race was the 2018 Cincinnati Flying Pig Marathon. He finished the Pig at 3:03:05. For 2019, the Boston qualifying standard was set at 3 hours and 10 minutes for men, ages 35-39. “I didn’t run the Flying Pig as hard because I was dealing with an injury, probably a hip flexor. I stopped running pretty much six weeks before the race. So I was mainly just on the bike spinning,” explains Kuntz. Injured or not, Kuntz easily beat the Boston qualifying guideline. His goal for the upcoming race is to just enjoy it and have fun. His memories of running Boston in 2016 are mixed. Kuntz finished but he developed calf cramps at mile 17. He started at a 6:30 pace but had to drop back due to the cramping. “I was at a 9 minute pace by Heartbreak Hill,” he explains. Heartbreak Hill is a steep, half-mile incline at mile 20 in the race. It strikes fear in Boston Marathon vets and newbies alike. Even with the cramps, Kuntz was able to finish his Boston debut with an official time of 3:05:28. His best time occurred during the 2015 Minnesota Grandma’s Marathon where he clocked a very impressive 2:52:09. Supporting the residents of Courtyard Park brings joy. The residents and staff on the unit hope to give some joy back to Kuntz as well. Kuntz’s residents and coworkers plan to watch the national broadcast of the Boston Marathon on Monday, April 15 via NBC Sports. Maybe he will wave while passing a television camera. To follow Christopher Kuntz online during the race, visit baa.org and enter bib number 6367. He will begin running in wave 1, corral number 7. The gun time for wave 1 runners is 10:02 a.m. There are 30,000 registered entrants of the 2019 Boston Marathon.